Beluga Whales Need Your Help! The Georgia Aquarium is proposing to import EIGHTEEN wild belugas, caught in the wild in Russia, to distribute to the three SeaWorld parks (Florida, California and Texas), Shedd Aquarium and Mystic Aquarium. Belugas are the wonderful white dolphins that inhabit the Arctic Ocean. They are also called the “sea canary” for their high-pitched whistles underwater, part of their communication and sonar. Like all such dolphins, they live in close family groups. Russia is becoming a bigger and bigger exporter of wild cetaceans as countries around the world shut down the blood dolphin$ trade. Belugas are chased by boats and netted, ripping them from their freedom and their families, the two most important things in their lives. But there is no reason to breed belugas in captivity except to put more on display. And the education and conservation benefits of displays of these and other dolphins in public are nonexistent. This is a rip-off of the public trust by aquariums seeking income from rare species to populate their small tanks. 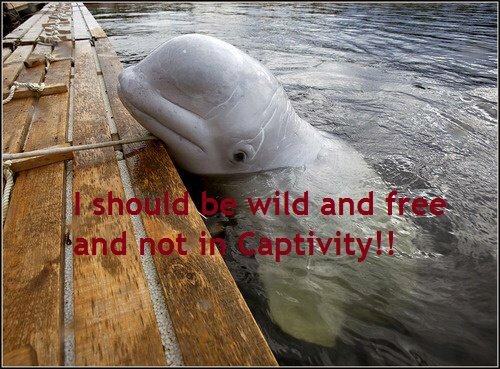 PLEASE HELP OPPOSE THE BELUGA WHALES IMPORTS! The US National Marine Fisheries Service (NMFS) is responsible for issuing the permits to import and hold any cetacean in aquariums in the United States. 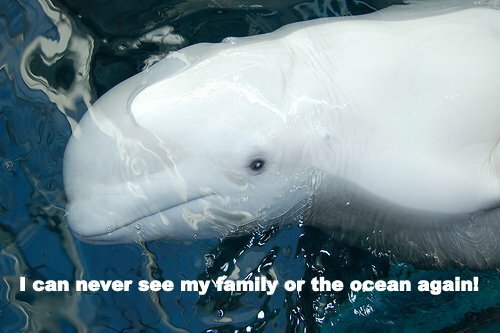 Your voice is needed to help save these eighteen beleaguered belugas.Deadline for Comments is October 29th, 2012″. (Read the entire article here) You can submit you comments to NOAA here. The article written by Ric O’Barry includes NOAA-NMFS addresses,phone numbers, and all the reasons why dolphins do not belong in captivity. Join The Dolphin Project with Ric O’Barry Here. Join Champions for Cetaceans and our friends at Save The Blood Dolphins on Facebook for current dolphin issues and news everyday. This entry was posted in Beluga Whale, Cetaceans, Dolphins, The Daily Scoop and tagged Arctic Ocean, Beluga whale, dolphins, Georgia Aquarium, Ric O'Barry, SeaWorld, Shedd Aquarium by Kirsten Massebeau. Bookmark the permalink.